The Bothy Garden Shed has been our best seller for the past 30 years! All sheds are designed and manufactured in the Dublin Mountains, all prices include FREE delivery and installation. Our sheds are made from the highest quality specially selected pine. Skirting fitted to all our sheds to hide 4inch (100mm) solid blocks which are supplied. This will be dependent on a clear and level site. What is charged as essential extras elsewhere is FREE at Timbertrove. 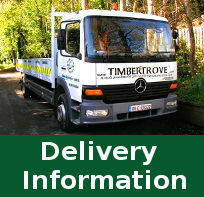 We can manufacture other sizes to order, please email sales@timbertrove.com or call our sales office 01-4931034. IMPORTANT DELIVERY AND FITTING NOTE: Currently we offer FREE fitting and delivery of this product to the greater Dublin area only. All other areas please contact our sales team. Click here to find out more about our delivery details. A clear and level site is essential for the construction of any unit ordered. Allow approximately 12"/30cm between new unit and any existing fence or wall. Access required: Side entrance with no overhead height restrictions or similar. If necessary please contact us for clarification.